The timber framed Falcon Inn on Lower Bridge Street is a Grade I listed building. 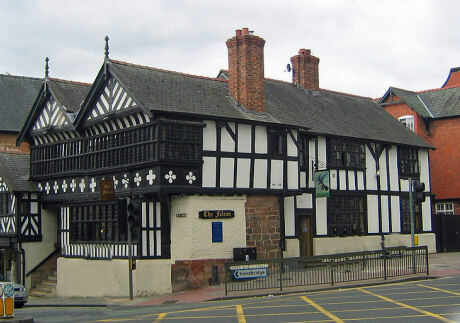 The inn stands on the west side of Lower Bridge Street at its junction with Grosvenor Road and formerly formed part of the Chester Rows. The Falcon was origonally a house and dates back to around 1200. The building was later extended to the south along Lower Bridge Street, with a great hall running parallel to the street. During the 13th century it was rebuilt to incorporate its portion of the row. It was rebuilt again during the late 16th and early 17th centuries. The medieval undercroft is now used as the beer cellar. The house was purchased by Sir Richard Grosvenor in 1602 who carried out extensive alterations to it some 40 years later to convert it into his town house. During the Civil War he moved his family here from his country home, Eaton Hall. In 1643 Sir Richard petitioned the City Assembly for leave to enlarge his house by enclosing the portion of the row which passed through his property. By the late 18th century the building had ceased to be the town house of the Grosvenor family but continued to be owned by them, and between 1778 and 1878 it was licensed as The Falcon Inn. In about 1879 alterations were made by John Douglas and it conducted business as a temperance house, under the name of The Falcon Cocoa House. About 1886 Grayson and Ould carried out a restoration, the present appearance of the building owes much to this restoration. The building had become virtually derelict by the 1970's, when in 1979 the Falcon Trust was established, and the building was donated to the trust by the Grosvenor Estate.